I've been racking my brain on this one! It aired in the 80s as what could have been an Outer Limits or Twilight Zone episode? The woman had the perfect family when suddenly, the program shuts down and she finds herself in a VR pod or chamber. 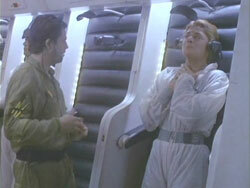 There are technicians discussing a malfunction in her pod and the camera zooms out to show hundreds of other chambers. I know; it sounds like 50 other movies or tv shows that do exactly the same thing. On an idyllic outdoor picnic with her husband and their daughters, a woman becomes confused and disoriented when sounds and sights begin stuttering and events repeat themselves. She awakens and discovers she is in a futuristic dream-making machine alongside hundreds of others in a sterile, industrial environment with no view of the outdoors. A technician explains to her that she was in the Dreamatron "Fully Interactive Dream" machine, running a Country Picnic program. He fixes the circuit board for her dream bay and tells her to relax and enjoy her last six minutes before returning to work. Apparently, her mind somehow fixed herself in the other life, and not her real life. Still confused, she returns to her dream world and relaxes again in her fantasy, but the machine burns out before technicians can disconnect her, trapping her in the alternate reality forever. All they can do is sadly note, "At least she died happy..."
Not the answer you're looking for? Browse other questions tagged story-identification the-twilight-zone or ask your own question.